IT IS EASIER to conjure the end of the Soviet Union by thinking of the coup of August 1991 that was the last gasp of the Communist establishment. Despite the fairly predetermined end of that drama, it was quite a drama. There was Mikhail Gorbachev, the General Secretary of the Communist Party of the Soviet Union, taken under house arrest at his dacha in the Crimea, his life possibly in danger. Then came the heroic gesture of that Russian bear Boris Yeltsin, standing on a tank and waving his fist in defense of Moscow’s White House. And there was drama, too, in the contrast of the Russian people who came out to the streets and protested in droves, with the thuggish conspirators in their KGB issued gray suits, ashing their cigarettes into the dustbin of history. The Communist hardliners lost, as we know, though Gorbachev returned to Moscow a terminally weakened leader. But it was not until December 25, 1991, a few months later, that the red flag was lowered for the last time and the Soviet Union was effectively declared dead. That drama was a much quieter one. The very final denouement took place in a series of rooms in the Kremlin and involved one last tug of war between Gorbachev and Yeltsin, who experienced the end of the empire as an historical event but also as just another turn in the tortured and bitter relationship of two men who could not have been more different from one another. Conor O’Clery’s popular history of this last day of the Soviet Union is as much a minute-by-minute account of December 25, 1991, as it is a recapitulation of all the bad blood, miscommunication, and histrionic power struggles that characterized Gorbachev’s and Yeltsin’s long acquaintance—a relationship that had an outsized impact on Russian history. O’Clery seems to have soaked up every detail of that last day, down to the truly trivial. Curious what Yeltsin ate on that fateful morning? Thin oatmeal porridge and tea followed by eggs, onion, and tomatoes fried in butter. And in many ways these details take the place of any real tension, since all that was left to do by December 25 was to hand over the nuclear briefcase. Gorbachev spent much of the day brooding alone in his office. By zeroing in on the relationship and its evolution until this moment—in chapters that alternate with the real time story of December 25—O’Clery shows how history can sometimes have a Tolstoyan quality of individual drama played out with consequences for millions. In this case, the Soviet Union’s demise presents itself as an affair of two men who could not stand each other. The personality differences were significant. Gorbachev always came off as suave and worldly, and also aloof and imperious. Yeltsin was erratic and often drunk, but he was more comfortable with people, and he made decisions based more on gut instinct than intellectual consideration. While Gorbachev’s quick political rise was due in large part to the help of connected party members who were charmed by his smooth manner and intellect, Yeltsin seemed to claw his way to the top by force of will. Ironically, it was Gorbachev who first elevated Yeltsin to the influential post of First Secretary of the Moscow Communist Party shortly after Gorbachev himself became General Secretary. This gave Yeltsin a permanent seat at the Politburo just at the moment when Gorbachev was preparing to introduce glasnost and perestroika. The promotion made sense at the time: Gorbachev wanted energetic, resourceful party members around him and Yeltsin, who had made an impression as the party head of Sverdlovsk, the empire’s largest industrial region, seemed a good collaborator for the upheaval to come. But as soon as Gorbachev began implementing his vision of gradual reform, Yeltsin found himself restless for a faster pace of change. Gorbachev came to see him as a rival, while Yeltsin portrayed himself on the streets of Moscow as the populist and the radical reformer that Gorbachev himself would not dare to be. The relationship exploded in the fall of 1987, when Yeltsin decided to resign from the Politburo. No one in Soviet history had ever done such a thing. And it led to an ugly series of episodes between the two, which cemented their enmity. Yeltsin denounced Gorbachev at a meeting of the Central Committee, and was then himself subjected to a spectacular show trial. Shortly after his resignation, Yeltsin had tried to commit suicide, and while he was hospitalized and drugged he was dragged to a meeting of the Moscow Communist party. There, twenty-three speakers tore into him over four hours, accusing him, as O’Clery writes of “everything from overweening ambition, demagoguery, lack of ethics, and ostentation to blasphemy, party crime, and pseudo-revolutionary spirit.” His speech slurred and his head propped up, Yeltsin was barely intelligible as he admitted that he was guilty as charged. Yet the force of history—or at least the will of the Russian people—was at Yeltsin’s back, not Gorbachev’s. The Moscow party boss’s extraordinary rebellion cemented him as a representative of a Russia waiting to be born, one that Gorbachev seemed increasingly to be standing in the way of. It also seemed that the more Gorbachev opened up Soviet society, the more opportunities he provided for Yeltsin to set up a burgeoning opposition. 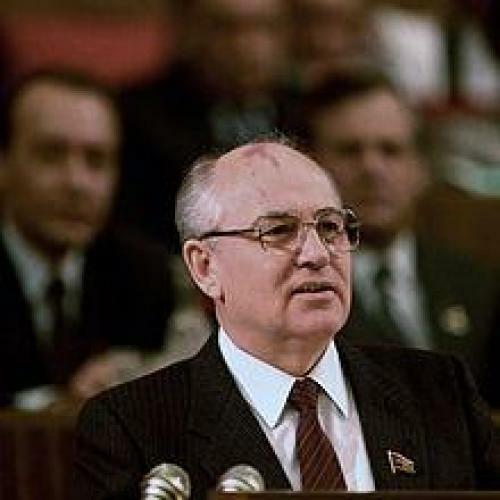 Gorbachev’s greatest democratic achievement came in June 1988, with the creation of a new Congress of People’s Deputies, of whom two-thirds would be directly elected. This set the stage for Yeltsin’s comeback. A year later he was elected the deputy from Moscow with six million votes, effectively granting him a major power base and a new democratic forum to debate openly the fate of the Soviet Union. By 1990, the balance of power had tilted Yeltsin’s way, and the Russian parliament voted in June for autonomy. Gorbachev railed against Yeltsin and the hurried pace of change. He told a gathering of newspaper editors that these radicals were ruining everything, and spoke contemptuously of their program of “a multiparty system, the right to leave the USSR, a market economy, free press, everyone doing whatever they please.” The following summer Yeltsin was elected the first president of the Russian Federation, and the end of the empire progressed at a rapid clip. Confronted by the constituent republics of the Soviet Union in July 1991, Gorbachev agreed to a new structure in which he, as the center, would hold on to foreign policy, defense, and much financial control, but the republics would otherwise govern themselves. At the same time he agreed that the level of taxes to finance the institutions of the center would be determined “in consultation with the republics,” effectively giving them veto power. The final blow came at a secret meeting between Yeltsin and the leaders of Ukraine and Belarus in the Belovezh Forest a few days later. There, between bouts of heavy drinking and visits to the banya, the three men signed a document effectively undoing the treaty of 1922 that created the USSR. Yeltsin did not even call Gorbachev himself to tell him. He informed George H.W. Bush first. “What happens to me?” Gorbachev demanded to know when the leader of Belarus broke the news. “Do you understand how this will be received by the world community?” Gorbachev was given until Christmas Day and forced to suffer a number of last indignities that O’Clery details at length, including moving himself and Raisa out of their house on short notice and practically being chased out of his office. Yeltsin was not gracious about the transfer, never granting any public credit to Gorbachev for voluntarily giving up power or for introducing, at great risk, the changes that made Yeltsin’s rise possible. The copious information of the last day, including the meta-details about how it was covered—both Ted Koppel and the relatively young network CNN play a role—are very much in the foreground of O’Clery’s account, but it is the background story of the Yeltsin-Gorbachev relationship that provides the tension and the drama. It is striking how muted and uneventful those last moments were, with Gorbachev placidly signing his resignation as president of the USSR and commander in chief of the Soviet armed forces. When in human history was such an empire—one that once covered one-sixth of the earth’s landmass—destroyed with no more than a barely audible whimper? Reading this history while the streets of Moscow are once again convulsing, it is difficult not to draw parallels that put the personal history of Gorbachev and Yeltsin into some perspective. For O’Clery, the fall of the Soviet Union was the result of one man, Gorbachev, who could not control the liberalization he himself had unleashed, and another man, Yeltsin, an arch-nemesis, who understood how to channel people’s discontent and took advantage of the moment of change. But the story is actually even simpler. It is about the loss of legitimacy that seems to happen every few generations when Russians, after having sacrificed democracy for the sake of stability, push back at authoritarianism. We saw it in 1991 when Gorbachev, no matter how hard he tried, could not make a case for holding the empire together, and we are seeing it today when Vladimir Putin and Dmitry Medvedev are struggling to make the case that they and their methods of centralization and control are Russia’s best bet. This is a now familiar Russian cycle, with the educated urban centers rising up after being made to feel like fools by leaders who end up seeming only interested in perpetuating their own power. Someone at this juncture usually comes along and captures this change in mood. Yeltsin did it then when he stood on that tank. It is not clear yet who will emerge this time and embody the role of the reformer. Sooner or later he or she will arrive. Gal Beckerman is a journalist and author. His first book, When They Come for Us, We'll Be Gone: The Epic Struggle to Save Soviet Jewry was recently published in paperback.